Home › Social Media | Yelp › Is Advertising on Yelp Worth it For a Small Business? Is Advertising on Yelp Worth it For a Small Business? If you are looking for ways to grow your business online reach out to me at jwojdylo@gmail.com. I have consulting and monthly advertising/SEO packages that can help you get more customers and clients. Over the last six months several of my clients have been approached by Yelp representatives. As one of my clients told me, “they are very aggressive.” At this point, the only way Yelp can make money is through advertising. Their advertising technique is to place business ads in their Yelp results. These ads show up above the actual results when Yelp users are looking for a business. Yelp also allows advertisers to place ads on their competitors Yelp listings. You can create your own opinion as to how you feel about this particular technique. To determine if Yelp ads are worth it for your small business it is important to come up with an advertising budget. There is no point even taking a phone call from Yelp, Facebook or Google if you do not have a monthly advertising or marketing budget. If you are a very small business that does not spend much on advertising there is a good chance you are going to find Internet advertising to be quite expensive. Google Adwords can charge as much as $75 to $100 per click for highly competitive terms. Yes, one click! Yelp has two options for advertisers – cost per impression or cost per click. Cost per impression is paying every single time your ad shows up when people are looking for a business. They may or may not click the ad. They may or may not even see the ad. Cost per click is exactly what it says. As an advertiser you will pay each time someone clicks the link to go to your Yelp profile. If you have a monthly advertising budget and you find that Yelp is much cheaper or more affordable than Facebook or Google it might be worth it to look into purchasing Yelp ads. Remember that many Yelp search queries show up on the front page of Google search. This means that Google searchers will likely click the result and your advertisement will be on the top of their page. If Google is charging $65 for this click and Yelp is only charging $12 it might be well worth it to advertise with Yelp rather than with Google. 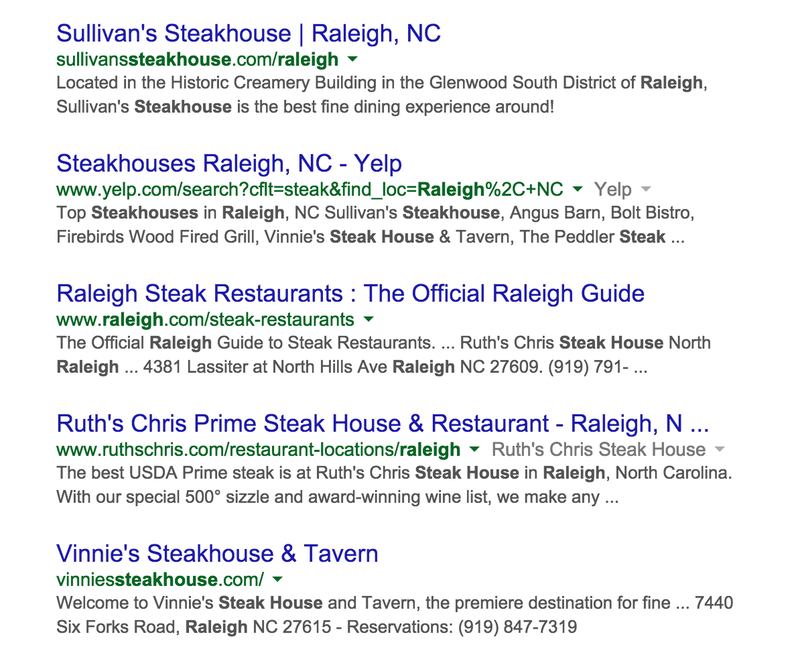 Notice the front page search results for “Raleigh Steakhouse”. The Yelp result is #2 and will likely be clicked on quite a bit. In fact, if I were searching for a Raleigh Steakhouse I would click the Yelp search results first simply because I know Yelp is respected in terms of dining options. I wouldn’t click any of the organic search results until I looked at the Yelp results first. UPDATE: Yelp has seen a drastic drop in Google search rankings with a few of the latest Google Algorithm updates. If Yelp does not rank well in search their business model is going to struggle; hence the reason for the stock price being down over 50% in the last year. I would strongly encourage you to know and understand what keywords are your “money” keywords. If Yelp does not rank on the front page of Google search for these specific keywords then I would say you could spend your advertising dollars somewhere better. If you do find that Yelp ranks on the front page of Google for your “money” keywords then it might be more affordable to advertise with Yelp and, in essence, have ads on the front page of Google. If you would like to better understand how to advertise with Google, Yelp or rank your website higher in Google search feel free to reach out to me at jwojdylo@gmail.com. I have several packages that can help you get more business from the Internet. Interesting analysis. Based on my own experience with Yelp, I would rather invest my budget with Google. As you pointed out there is some good traffic from google searches who end up on Yelp but other than that visitors are just researching specific company in many cases and the conversion is very low compared to Google PPC. For the first time I finally have a client destroying it with Yelp. He is using the exact strategy above. Yelp bounces around in organic search. This guy does plumbing. Currently the #1 result in Google is Yelp for “Plumbing + Cityname, ST”. When this Yelp result is at the top of Google he runs his Yelp ad. It is extremely cost effective. You click the Yewlp result from Google and there he is. He has been so busy lately he just hired a new employee and is getting a second truck on the road. Bonus: he uses his face instead of a company logo. When we switched from a logo to his friendly grin the phone went nuts. How does your client choose to run his Yelp ad? Are you saying that he regular searches that search term so that he knows it’s at the top of Google results? I was approached by a Yelp rep recently about signing up for ads, and it didn’t sound like I have the ability to run ads whenever I want, nor could I adjust my spend to ensure I’d be the top result. As far as I can tell, if I run a similar strategy in Google for different service business types, it is completely random what Yelp business result is on Google. not worth the 1 year commitment. Dont waste your time. You can get a lot more for your business buying services on fiverr. We have a client paying close to $17 a click on Yelp for a limousine business. We cannot justify it nor can Yelp as they claim compeition is fierce for the limo industry. COMPLETE BS. Google charges around $4 yet we do not see how yelp can get away with such a high rate.. Any take on this?? I signed up with Yelp advertising and in 2 months received 2 leads. Neither lead had anything to do with my business, so I can’t really count them as leads. The cost per click was all over the board from $12.00 to $22.00 . I contacted them and let them know I no longer wish to advertise with them, they asked what issues I had and when I explained it was like an oh well attitude they gave me. I spent almost $1600 for three months advertising for my Landscaping Design/ Build Service on Yelp. What a waste of time and money. Total of 28 clicks to my website, 3 mobile calls, 2 call to action links generated. Total of $0.00 in sales from Yelp. Those two calls were for services we do not provide. Their contracts are all or nothing, they offer no granular controls over your ad spend, you cannot suspend and restart ads, cannot target demographics. On top of that, their “account reps” do nothing except offer hard-sell customer retention. Google adwords offers much better controls, and puts you in charge of your ads, how much you spend, and where and when you spend it. I have been doing OK with the Yelp free listing, I get close to 40 contacts a month through them. I have never paid a dime. I know that Yelp makes a lot of money on it. Here’s the article on this topic – https://www.cleveroad.com/blog/how-much-does-it-cost-to-make-an-app-like-yelp But but I do not know for sure whether it is beneficial for small businesses..
1 Month. 56 Click. $347. Do you think $6.10 per click is a good deal? I don’t think so. I guess it depends on what you’r selling. If you’re the Porsche dealership, then that’s chump change, but if you’re selling video games and comic books, you’re probably better off with Google or Facebook ads. Yelp has been bugging me for years to advertise and I have always refused because it feels like extortion that you have to pay them to remove competitors ads from your page. Well, I got a $300 coupon, so I finally decided to give it a try and I’m not impressed. Even even with my discount, it’s still way overpriced for what you get. The one thing that is frustrating is lack of control over demographics and what time of day your ads run. I definitely don’t want my ads running when we’re closed and that really annoys me because it’s a waste of money. A lot of people don’t like facebook ads, but I’ve had some pretty good luck. with FaceBook, I can specify that I want only males to see my ad and under 18. This is awesome for an owner of a comic book store. Also, I think the younger crowd responds better to facebook. THIS COMPANY IS STEALING MONEY FROM SMALL BUSINESS WITH THEIR UNSCRUPULOUS TACTICS. THEY OFFERED ME $300 IN SUPPOSEDLY FREE YELP ADS. ONLY 10 PEOPLE VISITED THE PAGE AND THEY END UP CHARGING MY ACCOUNT ANOTHER $155. SO TOTAL $455 FNG DOLLARS FOR 11 VISITS!! THEY ARE WELL TRAINED EXTORTIONERS. HOW CAN THEY SLEEP AT NIGHT KNOWING THEIR EMPLOYEES ARE RIPPING OFF SMALL BUSINESSES. DONT GET ME STARTED ON WHAT THEY DO WITH THE REVIEWS. THIS COMPANY NEEDS TO BE INVESTIGATED ASAP. I HAVE SUBMITTED DOCUMENTS TO MY ATTORNEY GENERAL. HOPEFULLY THEY PUT A STOP TO THESE THIEVES. STAY AWAY FROM SCAM YELP ADS IF YOU ARE A SMALL BUSINESS. TRY ADVERTISING ON FACEBOOK. YELP WILL TAKE YOUR MONEY AND RUN. DON’T FALL FOR THEIR TACTICS. THEY ARE EXPERTS ON THE PHONE AND WILL GET YOU HOOKED. BE WARNED THEY ARE BEING INVESTIGATED.